On your next run, take along your own personal motivational coach on your feet. 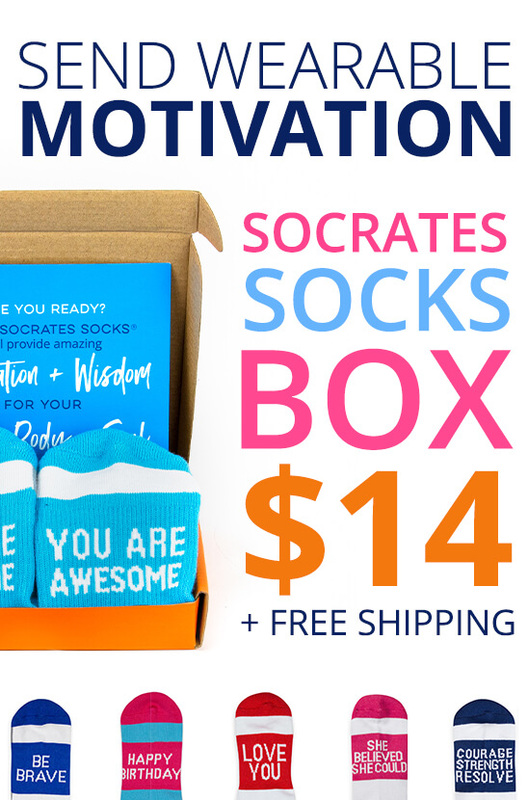 With an inspirational message on the top and a complementary message on the sole, your socks will keep you running when you think you've had enough. However, the help doesn't stop there. The top-rated, moisture-wicking socks for runners from Gone For a Run are made from synthetic fibers. The polyester, moisture-wicking yarns of these colorful, low-cut, ankle-length running socks are quick-drying and incredibly comfortable. Arch support and extra cushioning from the extra padding helps protect your feet with every step. Find your personal favorite here in the dozens of motivational phrases. You can choose “Never Give Up” for the top of the sock combined with “Believe” on the bottom. Or there is “Courage Strength” with “Carry On” or “Be Strong” with “Dig Deep”. You can also opt for “You Are Awesome” paired with “Crush It”. There are many other styles to choose from, as well. For moms, you will find “One Bad Mother Runner” paired with “Try to Keep Up!” or “Moms Run This Town” paired with “Running Together”. If you prefer humor, there is “May the Run Be With You” combined with “Do Or Do Not There Is No Try” or a colorful graphic that turns your foot into an open-mouthed shark. Race city, race distance and holiday selections are all available, as well. Moisture wicking is a critical element in these running socks. By drawing moisture to the outer layers of the sock, the quick-drying knit reduces the occurrence of blisters and bad odors. These high-performance ankle socks will keep your feet in peak running condition. To be sure you always have a clean pair, and for an extra discount, take a look at our sock sets. “Reach Your Goals”, “Good Karma” and “Adrenaline Runner” are just a few of our sock set collections. Or take advantage of bundling these great socks for marathons with the “Marathoner” and “Half Marathoner” collections. Give the gift of inspiration to your favorite runner—especially if your favorite runner is you.